Editor's note: our resident Pitching Mechanic FIPmyWHIP (Ron) returns to action to give us an inside look at Justin Verlander's 2016 return to dominance and why it's happening. You can reach him on Twitter at @FIPmyWHIP, or via email at fipmywhip@gmail.com. By now you've all probably seen the tweet JV posted after he struggled in his first few starts. Since then, he has backed up his words, dominating just as he said he would. But many haven't seen the whole story -- the how, and the why. As of June 30, Verlander has thrown 75 IP, with a 3.84 ERA, a 2.16 BB/9, a 9.1 K/9, a 1.106 WHIP, and an opponent slashline of .221/.278/.384/.662 since he posted that tweet on May 3. Prior to that tweet, he had thrown 34 2/3 IP, with a 5.46 ERA, a 3.0 BB/9, a 9.4 K/9, a 1.314 WHIP, and an opponent slashline of .261/.317/.505/.822. *Note: I prefer Brooks Baseball over any other site for PitchF/X data because their source data is reviewed and cross-referenced using video and other sources to ensure complete accuracy. For this research, we want to review things like how often each pitch is used, pitch velocity, what percentage end up as strikes, balls, and whiffs. We'll also want to review opponent success data, looking at things like batting average ISO (isolated power), to get the best gauge of how well hitters succeed against that particular pitch and the outcomes of those pitches. Comparing Verlander's PitchF/X data from both before and after the famous "I will dominate" tweet shows some incredible differences. His fastball velocity trends upward with a slight increase in almost every start, culminating on June 11 in his start against the Yankees, when he reached the highest average fastball velocity in a start since June 11, 2014. Over his three starts on June 5, June 11, and June 16, his average fastball velocity is 94.7 MPH. 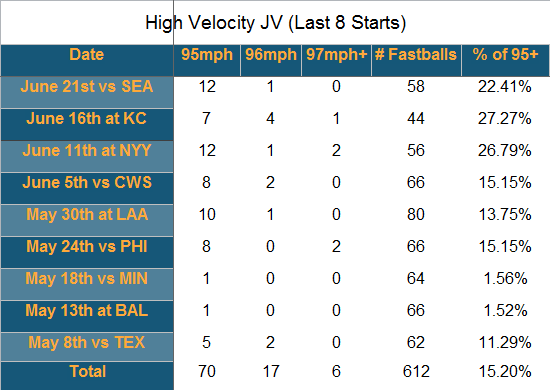 This chart breaks down how many pitches Verlander has thrown at 95+ MPH his last 8 starts. While there is insight here into how much better Verlander is pitching now, it's hard to really gauge his overall performance, since he was pitching so horribly to start the season. 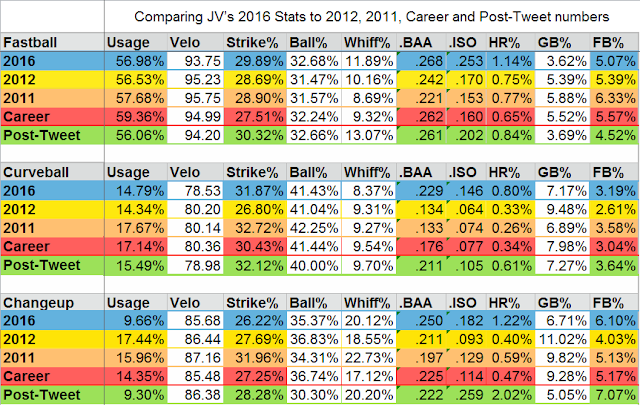 For another angle, then, let's look at all the same data from the entire 2016 season so far, and compare that to Verlander's MVP season in 2011, and his 2012 season when he led the league in ERA+, strikeouts, and innings pitched. We'll also include his total career numbers to get a baseline career average, and his "post-tweet" numbers just to show what form Verlander is truly in right now. Yes, it seems that a portion of his success is from swapping out his slider for a cutter. But how well is he throwing this new pitch? How does it stack up against those who have been throwing it for a lot longer? For a broader sample, let's compare Verlander's numbers to a wide range of pitchers who throw this pitc: guys who throw it hard, guys who throw it soft, guys who just recently added the pitch, and guys who have thrown it their entire career. 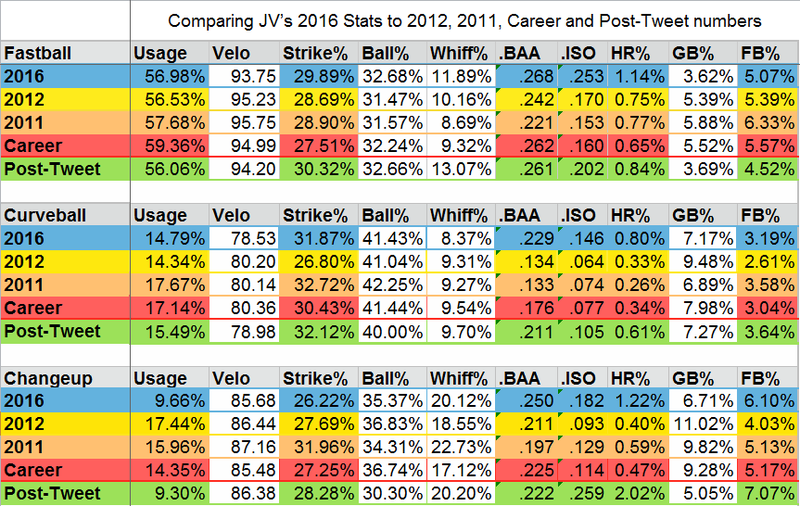 Below are Verlander's stats on his 2016 cutter compared to a sample of pitchers. Max Scherzer is the pitcher I chose to include as an example of someone who has recently added a cutter (last season, in fact). I chose him because not only was he a former Tiger, he's also very similar to Verlander in the way he pitches: they both throw the same pitch types, both are known for being power pitchers, and both are high-strikeout pitchers. The rest of the pitchers have thrown it for basically their entire careers, so I took their career numbers as a baseline for what Verlander's cutter should strive to become. 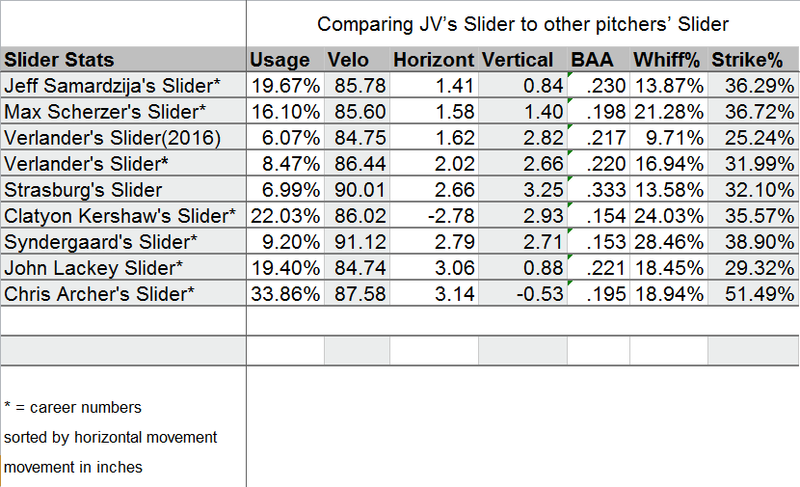 Now that we've seen how well Verlander's cutter stacks up to the field, let's circle back and try to determine why Verlander seemingly abandoned his slider. Looking at the first chart in this article, it's not hard to see why he abandoned the slider when you look at the batting average against, as well as the high ISO and high percentage of balls. Below is a comparison of both Verlander's career slider numbers as well as those same numbers from just this season, comparing them to some of the best sliders in the game. 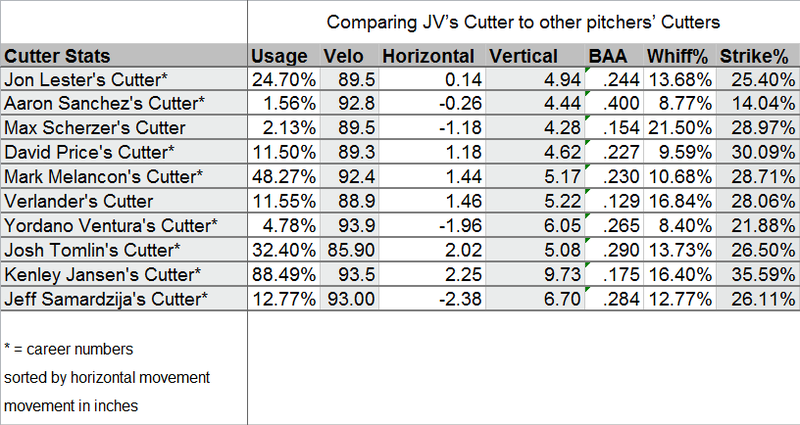 Finally, let's compare Verlander's cutter to his slider, for the simple reason of recognizing that they are actually two different pitches, regardless of what Verlander wants to say. He says it is just a new and improved slider, but there is one telling difference between these two pitches that allows us to separate them, and that difference is the vertical movement. One final fun tid-bit to keep our eyes on. 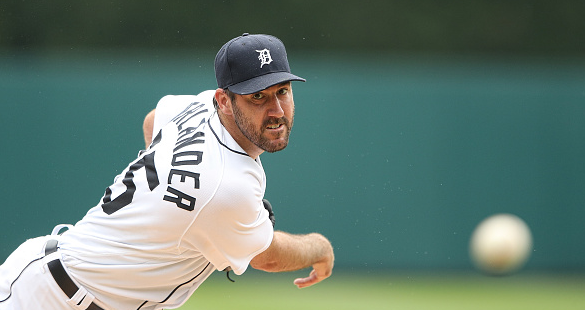 According to Brooks Baseball, on June 5, Justin Verlander threw 15 Sinkers. This is the first time Brooks has reported that Verlander threw a Sinker. It's possible this is an error, but it could be that Verlander is feeling out the pitch to see how it plays. Below is the data from that start. It's too early to say for sure that Verlander has added the new pitch, but if it appears in a couple more starts, it would probably be safe to say he's working with a new weapon in his arsenal.